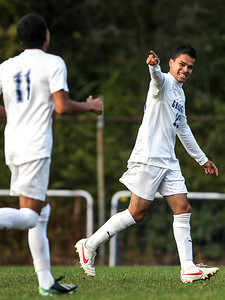 Sarah Nader- snader@shawmedia.com Dundee-Crown's Gerardo Escorza celebrates his goal during the first half of Tuesday's FVC Valley match against Jacobs in Carpentersville October 15, 2013. Dundee-Crown defeated Jacobs, 5-0 and finished their regular season 19-0-1. 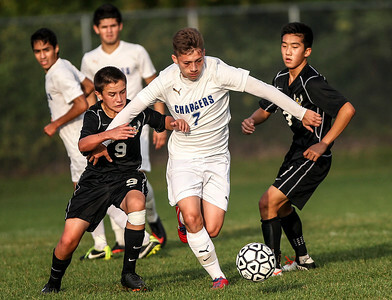 Sarah Nader- snader@shawmedia.com Jacobs' Daniel Kim (left) tries to steal the ball from Dundee-Crown's Francisco Nava during the second half of Tuesday's FVC Valley match in Carpentersville October 15, 2013. Dundee-Crown defeated Jacobs, 5-0 and finished their regular season 19-0-1. 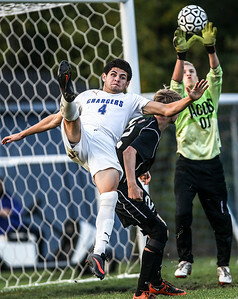 Sarah Nader- snader@shawmedia.com Dundee-Crown's Eduardo Arellano takes a shot during Tuesday's FVC Valley match against Jacobs in Carpentersville October 15, 2013. Dundee-Crown defeated Jacobs, 5-0 and finished their regular season 19-0-1. 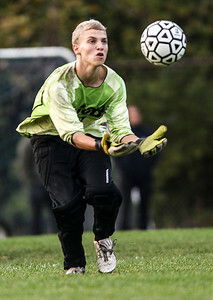 Sarah Nader- snader@shawmedia.com Jacobs' goalie Spencer Dixon stops a goal during the second half of Tuesday's FVC Valley match against Dundee-Crown in Carpentersville October 15, 2013. Dundee-Crown defeated Jacobs, 5-0 and finished their regular season 19-0-1. 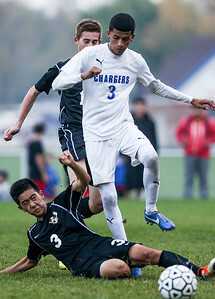 Sarah Nader- snader@shawmedia.com Dundee-Crown's Juan Ramos (left) is defended by Jacobs' Ean Wilson during the first half of Tuesday's FVC Valley match in Carpentersville October 15, 2013. 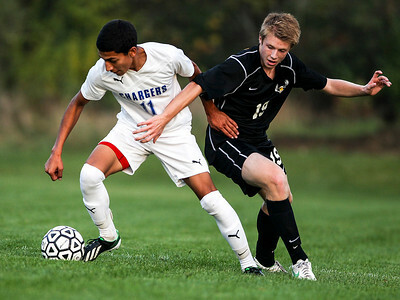 Dundee-Crown defeated Jacobs, 5-0 and finished their regular season 19-0-1. 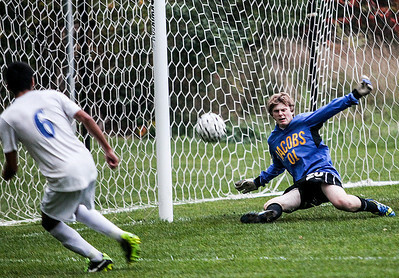 Sarah Nader- snader@shawmedia.com Jacobs's Aaron Camp stops a goal during the second half of Tuesday's FVC Valley match against Dundee-Crown in Carpentersville October 15, 2013. Dundee-Crown defeated Jacobs, 5-0 and finished their regular season 19-0-1. Sarah Nader- snader@shawmedia.com Dundee-Crown fans cheer on the boys soccer team during Tuesday's FVC Valley match against Jacobs in Carpentersville October 15, 2013. Dundee-Crown defeated Jacobs, 5-0 and finished their regular season 19-0-1. Sarah Nader- snader@shawmedia.com Dundee-Crown's Jason Horcher heads the ball during the first half of Tuesday's FVC Valley match against Jacobs in Carpentersville October 15, 2013. Dundee-Crown defeated Jacobs, 5-0 and finished their regular season 19-0-1. 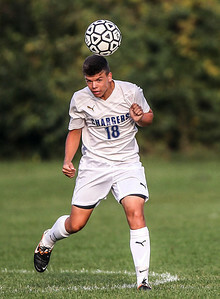 Sarah Nader- snader@shawmedia.com Jacobs' Nick Voss heads the ball during the first half of Tuesday's FVC Valley match against Dundee-Crown in Carpentersville October 15, 2013. Dundee-Crown defeated Jacobs, 5-0 and finished their regular season 19-0-1. Sarah Nader- snader@shawmedia.com Jacobs' Nick Voss (left) and Daniel Kim guard Dundee-Crown's Alex Ramirez during the first half of Tuesday's FVC Valley match against Dundee-Crown in Carpentersville October 15, 2013. Dundee-Crown defeated Jacobs, 5-0 and finished their regular season 19-0-1. 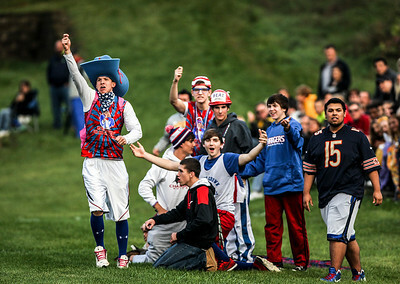 Dundee-Crown fans cheer on the boys soccer team during Tuesday's FVC Valley match against Jacobs in Carpentersville October 15, 2013. Dundee-Crown defeated Jacobs, 5-0 and finished their regular season 19-0-1.